Laboratory tests are one of the devices most used by modern medicine in the search for diagnoses. Blood tests, also called blood tests, are a group of complementary tests used by all medical specialties, hence the reason that almost everyone has already done at least one blood test in their lives. There is no single blood test to investigate all types of disease. There are hundreds of different blood tests that must be ordered according to the patient's clinical condition and the doctor's diagnostic hypotheses. In this text we will address some specific blood tests commonly requested by physicians, but whose purpose is seldom explained to patients. Among them we can mention ESR, CRP, Ferritin, LDH, etc. The rate of erythrocyte sedimentation, better known as ESR, is an examination used to evaluate the existence of inflammation in the body. The measurement of ESR is relatively simple. The collected blood is placed in a test tube species, as shown in the photo below, and the rate of precipitation of the red blood cells is measured in 1 hour. The result is given in mm/h. Currently this examination is done in an automated way by machines. Normal values range from 0 to 15 mm/h in young and 0 to 30 mm/h in the elderly. Women often have ESR slightly higher than men. When there is an ongoing inflammatory process, whether it is an infection, an active autoimmune disease, acute pancreatitis, advanced cancer, etc., our liver produces in large quantities a protein called fibrinogen. This fibrinogen acts as a kind of glue, binding red blood cells to each other, forming blocks of red blood cells, which are obviously heavier and fall faster, thus increasing erythrocyte sedimentation rate. ESR is therefore an indirect indicator that the liver is producing more fibrinogen, which in turn is an indirect indicator that there is an ongoing inflammatory process. The list is huge, just listed a few examples. As you can imagine, ESR makes no diagnosis of anything. It only suggests the possibility of an inflammation. In addition to being unspecific, since ESR is elevated in a large number of vas deferens, this examination is also susceptible to errors since small oversights such as blood storage may be sufficient to alter its outcome. It is, in fact, an examination that in the last years has lost importance, mainly after the popularization of the CRP (I explain below). Its great value is currently following some diseases such as rheumatoid arthritis, temporal arteritis and polymyalgia rheumatica, when an elevation of ESR may indicate an early relapse or an absence of response to drug treatment. A very high ESR, above 100 mm/h, is usually a useful diagnostic information because, besides being rare, the false positive in these cases, there are very few diseases that present such a high elevation, among them lupus, multiple myeloma, osteomyelitis and tuberculosis. As already explained above, in cases of systemic inflammation, our liver starts to produce several different proteins, called acute phase proteins. ESR is an examination that indirectly measures the production of fibrinogen, one of these proteins. The popularization of the C-reactive protein (CRP) dosage reduced the importance of ESR as a marker of inflammation, since CRP is also an acute phase protein produced by the liver. With this test we directly measured the levels of the protein itself, much more sensitive an indirect evaluation as in ESR. However, just like in ESR, the dosage of CRP shows us that there is ongoing inflammation in the body, but it does not tell us where it is or why it occurs. All conditions listed when I was talking about ESR may also cause elevation of CRP, except for advanced age, which causes only a slight elevation at best. CRP is more sensitive than ESR because, in addition to elevating earlier, it also serves to assess the risk of cardiovascular disease. It has long been known that cardiovascular diseases are caused by a combination of a constant and small inflammation in the walls of the vessels with the deposit of cholesterol in them. People with CRP levels persistently above 0.3 mg/dL (3 mg/L) are at increased risk of developing cardiovascular disease, such as heart attack or stroke. With these values, the CRP indicates that there is a discrete but continuous inflammatory process. Just to illustrate, CRP in viral infections is usually between 1 mg/dL (10 mg/L) and 4 mg/dL (40 mg/L). In bacterial infections such as pneumonia are usually above 5 mg/dL (50 mg/L). In cases of severe sepsis, the values may exceed 20 mg/dL (200 mg/L). Ferritin is a protein produced in the liver, responsible for the iron stores of our body. Iron is an essential element for our body, being consumed daily for the formation of new red blood cells. If the body does not have iron stores, it can not produce red blood cells, resulting in a state of iron deficiency anemia. Iron can not circulate through the blood in large quantities because of its toxicity. Therefore, it must be stored safely, but easily accessible to meet the needs of the body. A single ferritin molecule is capable of binding up to 4500 iron atoms, making it an excellent storage medium. Much of the ferritin is deposited in the muscles, bone marrow, spleen and liver, releasing small amounts of iron whenever necessary for the formation of new red blood cells. Blood ferritin dosage is usually performed for evaluation of body iron stores, useful information in cases of anemia, whose iron deficiency is one of the possible causes, or diseases such as hemochromatosis that occur due to excess iron in the body. In general, 1 ng/dL of ferritin in the blood is equivalent to a body stock of approximately 10 mg of iron. Therefore, a person whose blood ferritin is 50 ng/dL has about 500 mg of iron stored. Normal ferritin values may vary depending on the laboratory, but are generally around 30-300 ng/dL in men and 15-150 ng/dL in women (monthly menstruation causes iron stores to be lower in women). In most cases, ferritin is low when there is iron deficiency and high when there is excess. However, it is important to know that ferritin is also an acute phase protein such as CRP and fibrinogen explained in previous topics. Any inflammation can stimulate the production of ferritin, not meaning that there is an increase in iron stores. This may be a confounding factor in a diagnostic investigation. A person with iron deficiency anemia may have normal or elevated ferritin levels if they also have an associated inflammatory state, such as an active autoimmune disease, for example. 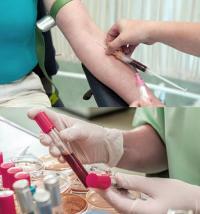 In cases such as this, it is necessary to use other blood tests to make the diagnosis of iron deficiency. Creatine phosphokinase (CPK) or creatine kinase (CK) is an enzyme present in several sites in our body, and is found in abundance in the heart and especially in our muscles. Its elevation in the bloodstream is a strong indicator of muscle injury, since the destruction of muscle cells causes a large flow of CK towards the blood. Creatine kinase (CK) acts by transforming creatine and phosphocreatine, a process that releases energy for muscle functioning. When we request the dosage of blood CK, we receive a value that corresponds to the sum of these 3 subtypes. Hence it is commonly called CK Total. If total CK is elevated because of an increase in CK-MB and CK-MM, this is a strong indication of heart damage, suggesting a myocardial infarction. If CK is elevated by elevation only of CK-MM, a severe muscle injury (rhabdomyolysis) is most likely. The dosage of CK-BB has little clinical utility. In clinical practice, there is rarely a need to test for CK. Usually this is done only in inpatients or in emergency services when there is a suspected infarction or in the attendance of some trauma, when the patient can present serious muscular injuries. On a daily basis CK can be requested to accompany patients who are using drugs that can cause muscle damage, among them, the statins used in the treatment of high cholesterol or corticosteroids. CK may also be useful in the diagnosis of some rare muscular diseases such as polymyositis, dermatomyositis, Duchenne's dystrophy and others. Lactate dehydrogenase, but known as LDH, is an enzyme present in many tissues, especially in the liver, muscles, blood cells, brain and heart. Their blood values rise whenever there is some tissue injury, which can range from a myocardial infarction to acute hepatitis. LDH is also often elevated in several types of cancer, in hypothyroidism and some lung infections. As it is an enzyme present in several tissues and cells, it ends up being a very non-specific examination, since numerous clinical conditions can cause its elevation. Alone, LDH gives us very little information.